Successfully Added Dynamo and Solar Powered LED Bicycle Light + Standalone Flashlight to your Shopping Cart. Dynamo and Solar Powered LED Bicycle Light + Standalone Flashlight: A mini yet super bright LED bike and flash light powered both by dynamo and sunlight! This super bright bike light is made of 3 powerful LEDs lighting up the path in front of you up to 10 meters away. It provides a pure while color, strong enough to show you any obstacles or dangers in the way, giving you plenty of time to avoid them. At night, the bright light is also great for alerting drivers and pedestrians around you, helping you be seen and thus protecting you from ending up on a hood or in a pit! Provided with an easy-to-install handlebar mount, this lighting device is ideal for those who commute by bicycle or enjoy cycling during their free time. This LED light is environment-friendly; it can be powered by either sun beams (solar power) or cranking (dynamo power). It means it recharges automatically when you are riding or your bike is parked outdoors. In case of poor lighting conditions, turn the crank located right under the lamp to produce power manually and avoid running out of juice. The LED light is also removable from the handlebar mount to be used as a normal flashlight. What more? 3 modes are available to adapt to different situations; normal for daily activities, very bright for campers spending the night in dark areas, and flashing to announce your location when you feel you might not have been seen. Get this small yet useful, powerful Dynamo and Solar Powered LED Bicycle Light and enjoy safe cycling anytime. It is brought to you at an amazing low price by the leader in lighting gadgets and electronics, Chinavasion. Dynamo and solar powered; environment-friendly, durable and self-sufficient! 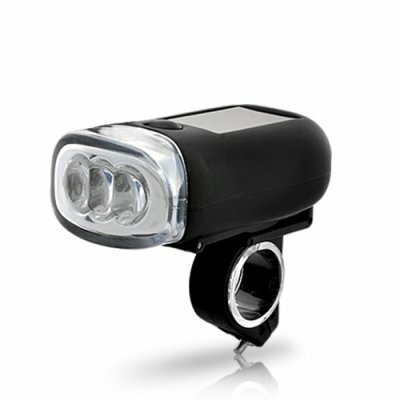 Great both as LED bicycle light and standalone flashlight.